A fabulous collection of short stories from the biggest and most exciting names in crime fiction, with a ‘mystery tour’ or travel theme. Crime spreads across the globe in this new collection of short stories from the Crime Writer’s Association, as a conspiracy of prominent crime authors take you on world mystery tour. Highlights of the trip include a treacherous cruise to French Polynesia, a horrifying trek in South Africa, a murderous train-ride across Ukraine and a vengeful killing in Mumbai. But back home in the UK, life isn’t so easy either. Dead bodies turn up on the backstreets of Glasgow, crime writers turn words into deeds at literary events, and Lady Luck seems to guide the fate of a Twickenham hood. Showcasing the range, breadth and vitality of the contemporary crime-fiction genre, these twenty-eight chilling and unputdownable stories will take you on a trip you’ll never forget. I love the Introduction at the beginning of this book which explains how the authors of this collection of short stories came together and the guide lines that they were given to write their stories. I have to say this is a collection to drool over and this statement includes both the authors involved and the stories that I read. 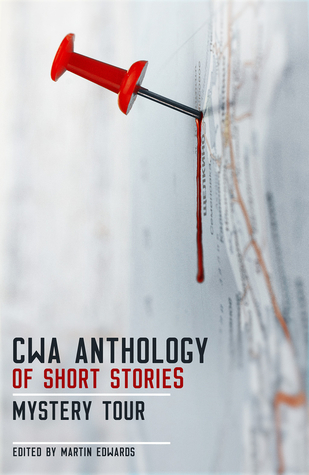 The core theme was “to write stories reflecting the unifying theme of travel and intriguing destinations.” Of course CWA is the abbreviation for Crime Writers Association, where all the authors are members, so crime too is a major player in the stories. I felt that a lot of these tales had that ‘The morale of the story’ feel about them but I obviously can not go into telling about any particular one, just that each is unique, compact and yet extremely satisfying with their conclusions. It has wet my appetite to want to read more from a lot of these authors and particularly liked that each was summed up at the end of the book with a paragraph about themselves and their books. There are twenty-eight diverse stories that cover a full spectrum of crimes, from selfish gain at the expense of innocent people to revenge, It really played with my emotions too as each one didn’t have time to stabilise in my mind before the next story began. There wasn’t a story that I didn’t like. A super collection. I wish to thank Orenda Books for providing me with an e copy of this novel which I have reviewed honestly. My copy of this arrived yetserday. I am so excited to read it. Cannot wait. Your blog review has done it immense justice. Great blog post!